Welcome to June's Meezer Musings! I've been thinking a lot about cat safety this month. Here in the UK, it's quite normal for cats to be allowed outside. There are no large predators, but outdoor cats still face all sorts of dangers including traffic, dogs, and thoughtless humans. In the United States or Canada, it's much more usual for cats to be kept indoors. In country areas and even in some urban ones, predators, as well as everything mentioned above are a real threat, and most if not all of the American rescue centers make it a condition of their adoption contract that adopted cats will be kept inside. Other countries (South Africa, Australia) seem to have mixed views on whether cats should be kept indoors or not. But wherever you live, what do you do if you'd like your cats to have an outdoor experience without worrying about where they are or what dangers they might be facing? Let's take a look at some of the options. 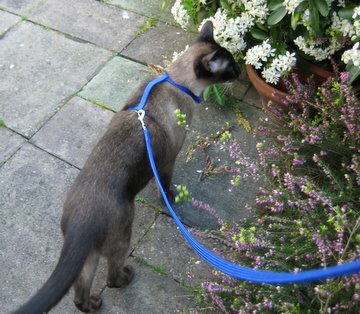 The first, easiest and cheapest option is to train your cat to walk in a harness so they can be kept near you when you're out in the garden or yard. When I first got Bandit, I did this quite successfully using a small dog harness, but that wasn't ideal as he managed to wriggle out of it once or twice. 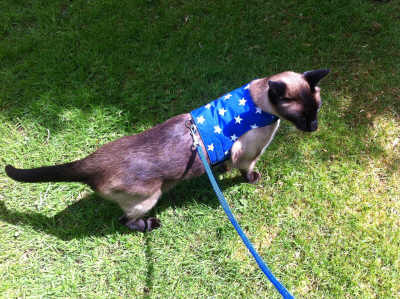 However I recently came across a much better option - Butterfly Cat Jackets - harnesses created by the owners of three beautiful Bengal cats, Jimmy, Thor and Tinkerbell. Bengals, like Siamese, are strong, active cats that need lots of exercise. Butterfly Cat Jackets say they've never known any cats to escape from their harnesses (they take their Bengals walking in the local woods) and they've even made miniature harnesses for ferrets! I liked the look of them﻿ so much I bought one for Bandit at a time when he needed to be kept under supervision, and was delighted with it - the harnesses are strong, well-made, fasten with Velcro, and come in a variety of fun patterns and colors. Catios are becoming popular these days - I've read several articles about them recently and one of our visitors posted a photo of her cat, Spencer, and his Catio on our Facebook page. Catios are cat-safe enclosures made from wire netting or chain-link fencing. They usually join on to or surround the house or apartment, but you can find free-standing ones that can be erected anywhere. There are lots of good examples on this page from Catio Showcase if you'd like to learn more about them and see all the many different examples. behind the rush matting that disguises it. Another secure way of partitioning off outdoor space for your cats is to enclose your whole yard or garden in cat-safe fencing. 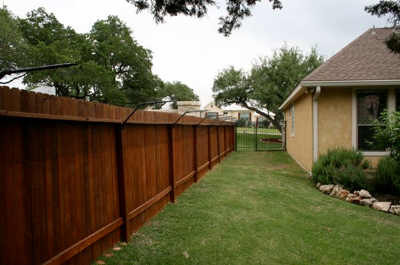 Purr...fect Cat Fence (www.purrfectfence.com) can either be built as a complete, free-standing fence or added to the top of your existing fence to make it cat-proof. As you can see, it works by means of the fence 'topper' that curves inwards. 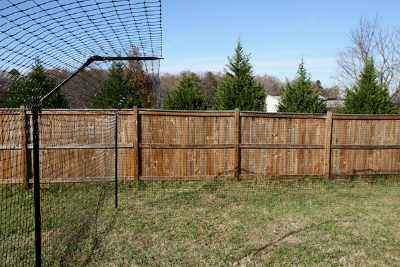 The photo above is of the free-standing version, while below you can see the top added to an existing fence. In both cases, the fence blends well with the landscape and at a distance is almost invisible. 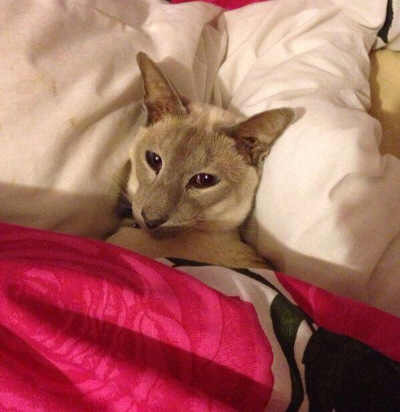 Our Meezer of the Month for July is Lilac Point Gizmo, who, as you can see, loves relaxing - especially when it's snuggling in his human's bed! We've actually seen Gizmo here on the site before - there's another lovely photo of him on our Lilac Point page - but I couldn't resist this one. We're nearly into July, and for our American friends that means Independence Day parties and fireworks. Cats and dogs have sensitive hearing and don't like loud noises. It goes without saying that animals are best kept indoors at firework time, but here are a few additional tips to keep your fluffy ones happy and comfortable. Find the quietest room. 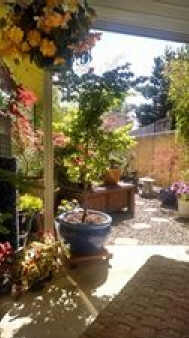 Create a safe space in the most peaceful room in your house. Put your cat's bed, toys, food, water, litter tray and any other comforts in there and make a hideout for your cat. Calming pheromone plug-ins or sprays like Feliway can help keep your cat calm. Spray it around your safe space or anywhere else your cat likes to hide out. Staying calm yourself and not reacting to loud bangs also helps to reassure your cat that nothing is wrong. Our show section of the newsletter has its own full page on the website now - if you're looking for the cat shows, you'll find them here. If you live in the States, we'd like to wish you a very happy Fourth of July Independence Day, and if you're anywhere in the northern hemisphere, we hope you're enjoying perfect, warm, summer weather.